While on my solo motorcycle trip, I tried to hit as many U.S. National Park that was on my route. In total, I managed to visit 12 of them with the majority of them were in California, my home state. It wasn’t in my itinerary to try to hit as many of them I could. The trip was more about riding the old back roads for the historical perspectives than to say I have been such and such place. So when researching for this challenge, I didn’t realize that there are 59 National Parks in the United States. After reviewing the list, I noticed that in my lifetime, I have been to 22 of them already. Out of the other 37 that I haven’t visited yet, Yellowstone National Park is on top of my list of places that I would like to visit before my time is up. Yellowstone National Park is approximately 3,900 square miles that covers three states, Wyoming, Montana and Idaho. The parks offers natural wonders such as geysers and hot springs. Also give hikers many areas to view vistas and the opportunity to see hundreds of animal species, such as bears, wolves, bison, elk and antelope. Out of the nine must things to do and see in Yellowstone, only three tickles my fancy. One is to see the Old Faithful Geyser in action. 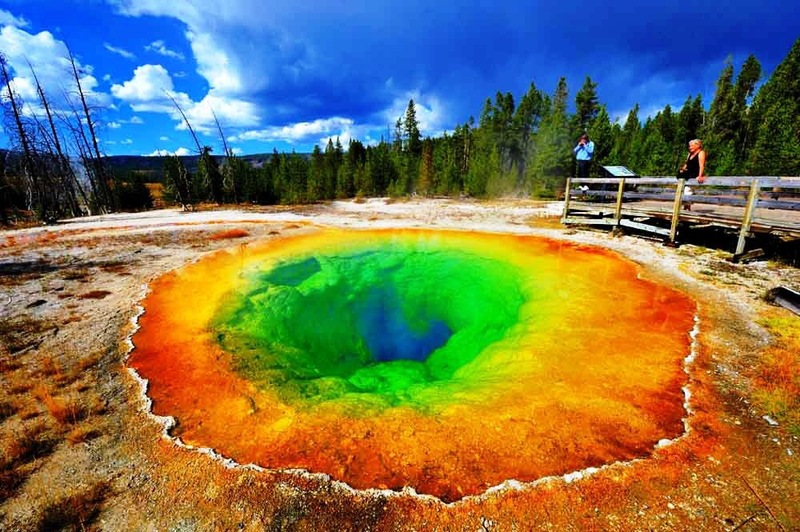 Two, is to hike to see the variety of colors that encompass the largest hot springs, Grand Prismatic Spring. Then lastly, I would like to see majestic Bisons roaming the Hayden Valley. I’m sure that I will get to visit many other National Parks but there so many places and things I wants to do, I just don’t know that I can get it all it in my lifetimes. This is the reason why I follow other bloggers on their journey so I can live it through their eyes. I often have trouble commenting on your blog. I’m not sure why. I’ve left quite a few comments that just never post. I have others tell me the same things. Don’t know what’s up with WordPress. That’s on my bucket list too! The worldwide is truly a wonderful place, but you are right one it’s pretty difficult to fit everything into one lifetime! Thank goodness that we live in an age where we can enjoy our planet’s richness through electronic media….but it still doesn’t really beat jumping on your bike and go see for yourself! Try visiting Yellowstone in the winter. Great x-country skiing and the geothermal features become, for lack of a more fitting word, magical.